Windows 10 - Coming to an Arduino Near You? Windows 10 – Coming to an Arduino Near You? Windows 10 has yet to be finalized, but it’s already made some pretty big waves. For the first time in a long while, people have a genuine reason to get excited about a new version of Windows. The latest announcement to catch everybody’s attention is Windows 10 being the first Arduino certified operating system. Arduino What is Arduino: Everything You Need to Know (In Video) What is Arduino: Everything You Need to Know (In Video) What is an Arduino and why should you care? In this video, I attempt to answer that question, and more. Read More already an incredibly popular line of microcontrollers. The $25 boards ($5 if you purchase unofficial models) are commonly used in Internet of Things What Is The Internet Of Things & How Will It Affect Our Future [MakeUseOf Explains] What Is The Internet Of Things & How Will It Affect Our Future [MakeUseOf Explains] It seems like there are new buzzwords popping up and dying off with each day that passes us by, and "the Internet of Things" just happens to be one of the more recent ideas that... Read More and DIY electronics projects – as diverse as night lights Arduino Night Light and Sunrise Alarm Project Arduino Night Light and Sunrise Alarm Project Today, we'll be making a sunrise alarm clock, which will gently and slowly wake you without resorting to an offensive noise-making machine. Read More , motorized laser turrets Pew Pew! How To Build A Laser Turret With An Arduino Pew Pew! How To Build A Laser Turret With An Arduino Are you bored? Might as well build a laser turret. 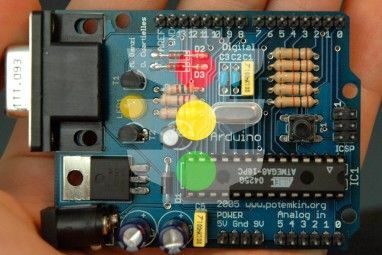 Read More , and Pong games How To Recreate The Classic Pong Game Using Arduino How To Recreate The Classic Pong Game Using Arduino Pong was the first ever videogame that reached the mass market. For the first time in history, the concept of a "video game" was brought into the family home, thanks to the Atari 2600 -... Read More . “Arduino Certified” simply means that it’s easier for developers and makers to integrate Arduino projects with the Windows operating system. The official announcement gives the example of an Arduino security camera that is controlled through the Universal Windows Platform, and can be extended to Microsoft-operated, cloud-based motion detection and facial/voice recognition systems. So, what does this mean for makers? And more importantly, should anyone care? Windows 10 is one of the more ambitious projects to come out of Redmond in recent years. But unlike earlier iterations of Microsoft’s flagship operating system, it’s not a single OS, but rather an umbrella of operating systems Windows 10: The Dream Of A Cross-Device Operating System Is Becoming Reality & It's Free Windows 10: The Dream Of A Cross-Device Operating System Is Becoming Reality & It's Free Microsoft is boldly stepping into the future with innovative software and hardware. Windows as a service and mobility of experience were the major keywords from the recent Windows 10 briefing. Most importantly, Windows 10 will... Read More that covers an entire spectrum of devices, from tablets and desktops, to embedded systems and microcontrollers. In the latter category, we have Windows 10 for IoT. Announced in February, it runs on the Raspberry Pi II Another New Raspberry Pi... and it Supports Windows 10 Another New Raspberry Pi... and it Supports Windows 10 Read More , and is provided free of charge by Microsoft. This is a decidedly unusual move for Microsoft – a company that turned Bill Gates into a multi-billionaire by selling huge volumes of software rather than giving them away. But Microsoft isn’t expecting people to use their Raspberry Pi II as their main computer. Not with its anemic CPU and scarce RAM 5 Things You Can't Do With Raspberry Pi 2 5 Things You Can't Do With Raspberry Pi 2 With a quad core CPU and boasts of being able to run Windows 10 – is the Raspberry Pi 2 really all that? Here's 5 things the Raspberry Pi 2 still can't do. Read More . They’re not worried about it cannibalizing sales of PCs and Tablets. Rather, they’re expecting people to use it in lieu of Linux for Internet of Things projects, which can be built by connecting the Raspberry Pi’s built-in GPIO pins Getting Started With GPIO On a Raspberry Pi Getting Started With GPIO On a Raspberry Pi If you though the Arduino was cool, just wait till you get your hands on a Raspberry Pi - these things are amazing. As well as being a fully functional computer, they also have a... Read More – 26 of them – to sensors, servos, LEDs, and more. Microsoft’s IoT ambitions don’t just end with the Raspberry Pi, though. 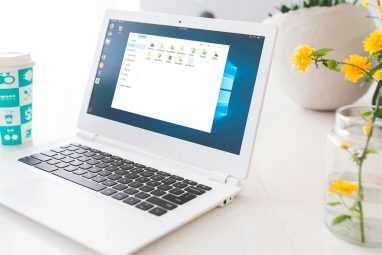 The company has also made it phenomenally easy to connect an Arduino to systems running Windows 10 through two different software libraries. Windows 10 is built around a design philosophy of a Universal Windows Platform, where applications can be written once, and used across the entire family of Windows 10 devices. 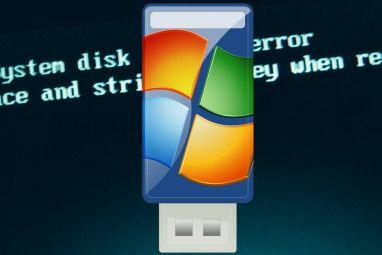 Consequently, any application built around the Windows Remote Arduino library can run on Windows 10 Phones, as well as traditional computers, and Raspberry Pi systems. The second product in the Microsoft Arduino family is Virtual Arduino Shields. This makes it possible for any Bluetooth-enabled Arduino device to use the sensors and functionality of a Windows 10 smartphone, rather than using an Arduino Shield The Top 4 Arduino Shields To Superpower Your Projects The Top 4 Arduino Shields To Superpower Your Projects You’ve bought an Arduino starter kit, you’ve followed all the basic guides, but now you’ve hit a stumbling block - you need more bits and bobs to realise your electronics dream. Luckily, if you have... Read More . These are notorious for being eye-wateringly expensive, with the most elaborate costing hundreds of dollars. But this makes it possible to replace individual shields with a single smartphone (In this case, a Lumia 535 or 635), potentially saving developers hundreds of dollars. Both of these libraries are available to download now from Github. Microsoft has seemingly graduated from Bill Gates’ original vision of a computer “on every desk and in every home”, to a vision where computers are integrated into everyday, commonplace items, and with Windows powering it all. In traditional Microsoft fashion, they’re late to the game here. Arduino is approaching its tenth birthday, and Microsoft ignored it for almost a decade. This left a vacuum for other companies to build the kinds of products Microsoft has just released. For instance, the 1Sheeld 1Sheeld, The Ultimate Arduino Shield Review and Giveaway 1Sheeld, The Ultimate Arduino Shield Review and Giveaway A single Arduino shield that can link with an Android device and provide a multitude of sensors and advanced functions? Yep - that's a thing now. The 1Sheeld, in fact. Read More , from Egyptian-based Integreight, which we reviewed just a few months ago. This affordable ($55) Arduino shield lets developers integrate the sensors of their Android smartphones with their Arduino-based IOT projects. At the time, reviewer James Bruce remarked that the 1Sheeld was “an amazing bit of kit to have around the workshop” and “the sheer versatility [of the 1Sheeld] is outstanding”, but he had reservations about its long term usefulness, given that it has to be tethered to a mobile device via Bluetooth. A New Beginning for Microsoft. Over the past few years, Microsoft has shaken off its stuffy, corporate image – and its long, insular legacy when it comes to cooperating with other major tech companies. This latest foray into the IoT world only emphasizes that. The .Net Gadgeteer was, of course, a commercial failure which enjoyed nothing like the success of the Arduino. However, if anything, Microsoft’s willingness to engage with the Arduino community shows how radically it has changed as a company, especially since the hiring of Satya Nadella as CEO. In just over a year, the company has open-sourced the .Net framework A GNU Beginning For Microsoft: What An Open Source .NET Framework Means For The Rest Of Us A GNU Beginning For Microsoft: What An Open Source .NET Framework Means For The Rest Of Us Microsoft just released a significant part of its code under a permissive open source license. This move breaks with years of tradition. But why and what does it mean for you? Read More , released Visual Studio for the Mac world, and made Microsoft cool again. But why should Microsoft care about the Internet of Things – a relatively niche field still in its infancy? It’s true that the only people truly excited about IoT today are an elite of developers and power users. But it’s also true that what becomes the norm for power users eventually becomes the norm for everyone else. Microsoft is abundantly aware of that, and wants to be at the center of this rapidly growing market before it enters the mainstream consciousness, and before a rival company gets there first. In the process, it’s going to make it easier, faster, and more accessible to build IoT devices. In short, Microsoft wants to do for IoT what it did for productivity software, and for operating systems. 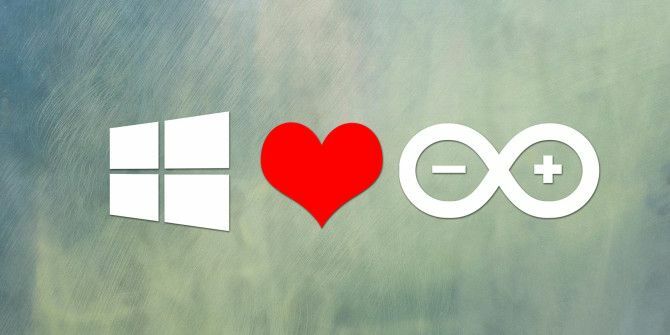 Will you be using Windows 10 with your latest Arduino product? Have you got a burning idea for a Microsoft-powered IoT device? I want to hear about it. Drop me a comment, and we’ll chat. Explore more about: Arduino, Internet of Things, Windows 10. Would be more useful if they had a pattern for building a browser based app that would work on all mobile devices. Without a replacement for Touch ID, I won't be replacing my iPhone with Windows Phone any time soon. Looking forward to this after the open-sourcing of .Net and thinking on new possibilities! my Aunty Ella recently go ac fantastic black Suzuki SX4 Hatchback by working part-time off of a macbook air..